Bought the BIG shopping bag early. That's a really good ability, but I didn't use it enough. Idiot. During each season, the players will each get 6 actions. After each season, a blind bid will be held to pay for the endorsement of a VIP ( gives you points ), an income round will provide more money, and players will cook new recipes. This carries on in a similar fashion for 4 seasons, with the exception that after the 4th season, players will score points for the most money, and score points for the best full menu set ( comprises of a starter, a first course, a second course, and a dessert ). After which, players will enter a final scoring for all their wines, recipes, restaurant decor and extra points from bonus cards and the player with the most points is the winner! My pimped out restaurant with classy tables and a playground. 2 Michelin Star People ! 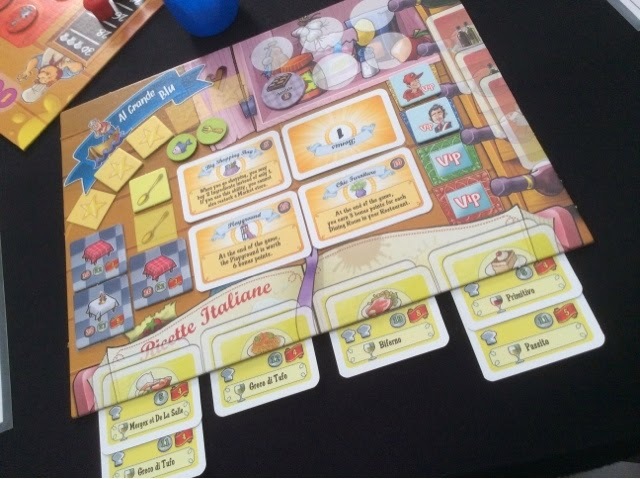 The gameplay in Ristorante Italia is extremely simple. You buy stuff, and buy more stuff. That's it really. You try to cook certain types of recipes that match a set you want, and that provides a high income and points, but each turn is all about finding what you need before the season ends. 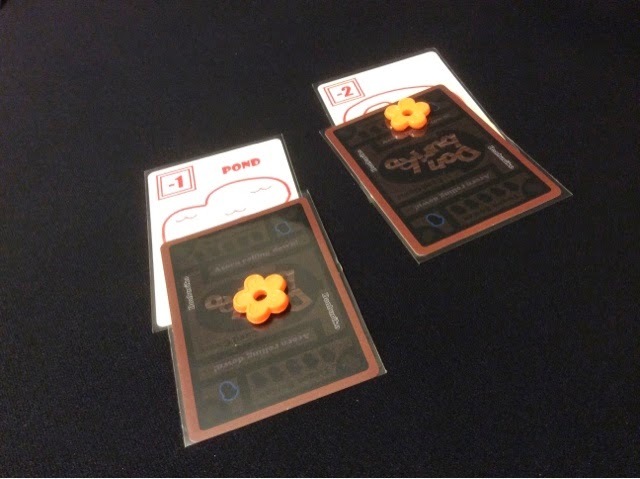 What makes each game different are the bonus cards you buy that allow you to bend certain rules in the game. These cards give you a variety of benefits such as points, one time effects, or ongoing abilities. I didn't go through a lot on how points are scored because there are quite a few ways to obtain various amount of points. It's not point salad-ish, but there are distinct paths for points scoring at different areas in the game. 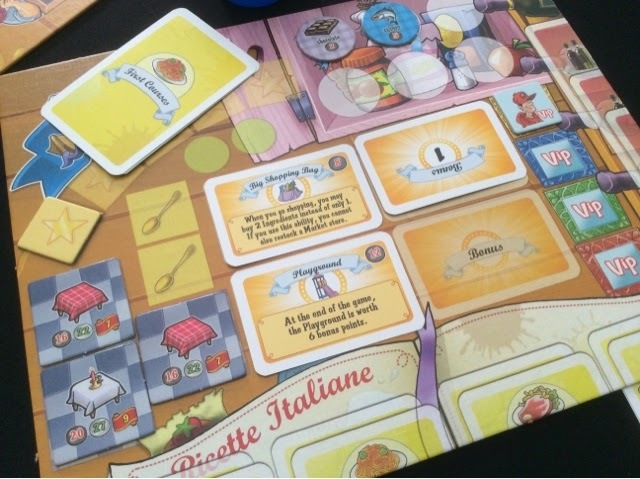 At its heart, Ristorante Italia is a set collection game. 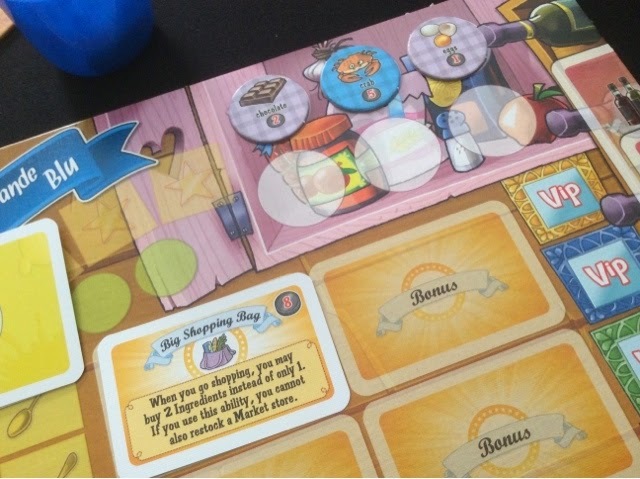 You collect ingredients to cook recipes, you attempt to cook certain types of recipes to have a themed full menu, you decorate your restaurant for points, you buy bonus cards for abilities and points. What is great is that everything falls thematically into place. The recipes require ingredients that you would find in whatever dish you are trying to cook. By pairing the right wine with the type of dish you are serving, you will also score bonus points. Decorating your restaurant is aesthetically pleasing and very worthwhile in terms of income and more points. I especially love the art in Ristorante Italia as well. 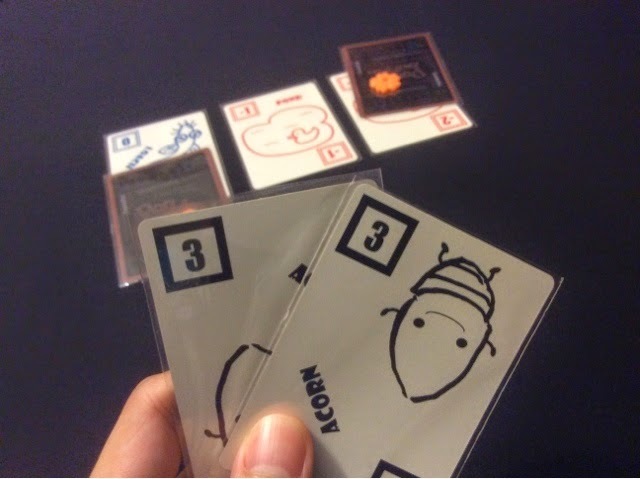 It is very cartoony, but I think it suits the flavor of the game. I couldn't imagine buying realistic looking meat from the market. Like, who wants to see bloodied turkey meat or pork on your cupboard chits? I think the art style lends itself well to make the game very accessible for all ages. Anyway, I lost - again. I have never won this game. Haha. I came close this time, 2nd by tiebreaker. I had a kickass restaurant with a very lovely playground to boot. But my menu was on the weaker end and I paid the price. Ties are broken by who is the better chef, and that definitely wasn't me. My friends really took to the game and it was voted the best game played that day. Do I agree? Hmmm, not sure, I very much like the next game we played that day as well. Before I ever played Castles of Burgundy or Dungeon Petz, this was possibly my favorite game ever. 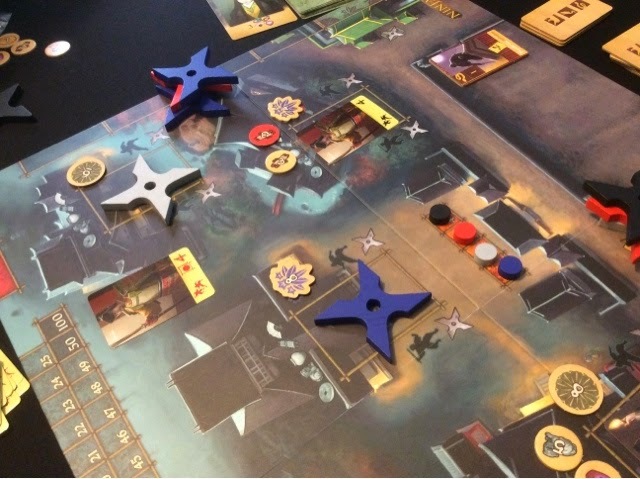 Ninjato is a game of too few actions. I feel that way all the time. You have a total of 21 actions in the whole game, and yet there is so much you need to accomplish in those 21 actions. There are 7 rounds of 3 actions each. Each round you may use an action to learn special abilities, draw fighting cards, storm a house, bribe envoys, or spread rumors. Each of these areas are very tightly intertwine with each other. The most straightforward process to score points is to collect cards and abilities, storm a house (steal its treasures), use the treasures to bride envoys or spread rumors. But because you have so few actions, you usually bypass or forgo a stage of the process and run your luck through the game. Drawing cards and learning abilities are straight forward - place your action token and take what you want. The interesting part is when you storm a house. During this phase of the game, you may choose to overpower the house through brute force, or to use stealth to accomplish your mission. Each has their own pros and cons as it depends on what abilities you have learnt or which cards you have picked up. Choosing brute force means you have to play cards higher than the guard number of the house (this changes randomly each time you go future into the house), choosing stealth basically means you need to play a lower card. This is where the push your luck aspect comes in. Are you confident that you can finish the house with what you have obtained so far? It is not mandatory to wipe the house out, but when you do you may decide which clan it now belongs to. This clan selection is important as that is the reason you end up bribing envoys. These envoys give you control over 1 of the 3 clans, and the more represented the clan is on the board, the more points the owner of the clan will score. This leads to a back and forth among players to be the first to bride envoys of a certain clan. Lastly, spreading rumors give you additional end game points. The more rumors you spread of a certain type, the more points you will score at end game. Two house have been successfully stormed. New guard will appear for the next round. All these come together to form a very tight and fulfilling game - for me. I must say though that I was rather fortunate. My friends did not notice me obtaining a particular card that is worth 6 points per card if I was the only player to own it. Had someone intercepted one of the cards from me, I would have lost 2 points per card I own ( as the card would now be worth only 4 points per card ) and that would have been enough to hand me 2nd place ( I won by a mere 7 points ). 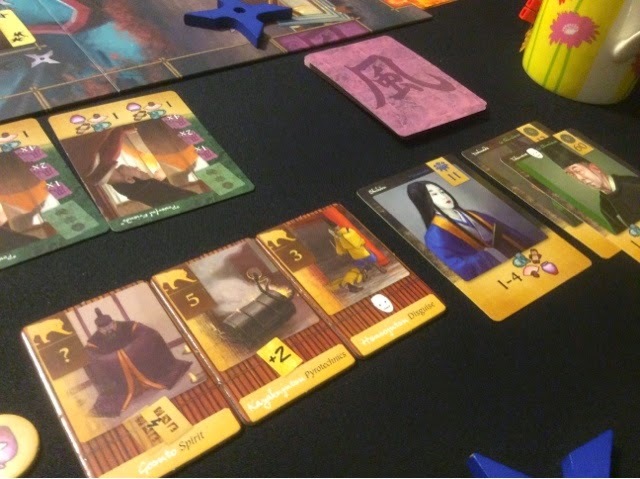 I love how you can specialize your "art" in Ninjato. You can be a pure brute force ninja, or a stealthy one. You may even go the route of flexibility where your skills allow you to increase or decrease your card number by 1, some allow you to swap from strength to stealth and vice versa. Its this flexibility and myriad of choices that keeps me interested and engaged in Ninjato. You want to out maneuver your opponents to certain spaces on the board, but its terribly difficult to do so. It's not a worker placement game where spots are locked once taken, but the timing of taking each spot is extremely crucial. If you are too late, the treasure or envoy you want may no longer be there, or if you aren't thoroughly prepared, then your action against a house will be in vain. I don't think there was ever a game where everything has gone as planned for anyone. You will always find each player one turn short or too slow for accomplishing what he/she needs. And that is such a beautiful thing in a board game. I must say that both our games of Ristorante Italia and Ninjato took quite awhile. 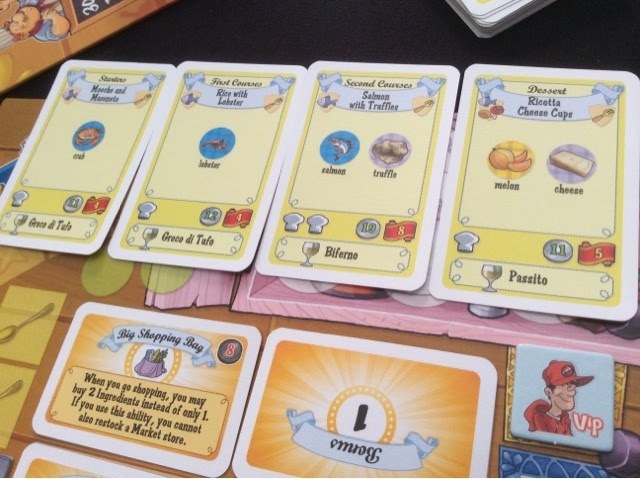 Ristorante Italia has been a steady 30 mins per player for all my plays, and this time it was no different. So that was 2 hours in total. 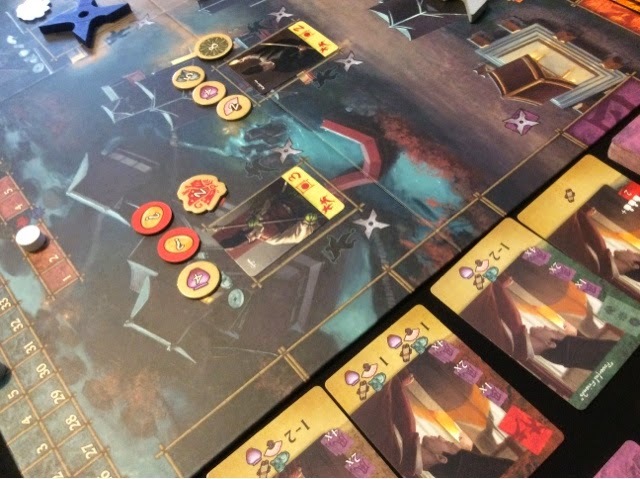 Ninjato was supposed to play faster but we ended up taking another 2 hours as well. By now my friends were kinda drained, and the next day was a working day, so we settled for 2 smaller Japan style games. To fill the gap while dinner was arriving, I took out Donburiko. A very nifty bluffing game that I'm very glad I pony-ed up some money for. I found a seller in the UK who was willing to ship it to me, and viola! Another Japanese game in my collection. Gotta catch em all! Donburiko is a very elegant outright bluffing game. 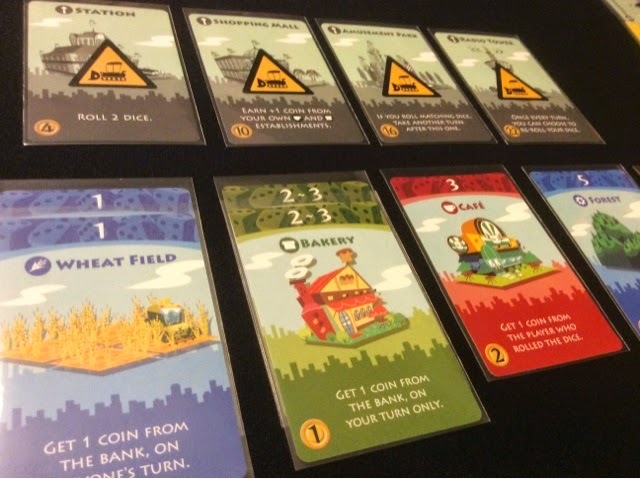 Players play till the bank runs out of points or when a player reaches 20 points, and that would signify the last round of the game. Each round one card is played face up on the table per player in the game. On a player's turn, you must either play a card or take a row of cards ( you can only take a row of 2 cards or more ). If you play a card face down, you have to give up a point, if you play a card face up you may take a point from the bank. What players are trying to do is to take a row of 0-6 points. If you do, you take that many points from the bank ( if you take a row of 6 points, the round immediately ends ! ). If you take a row of any other number ( -2, 7, 10 ), you must pay from your personal supply the number of points differential from the next scoring number. So if you took a row of 10 points, you must pay 10-6 points. If you took a row of -2, you must pay -(0-2) points. Donburiko.. Such a clever little game. I am constantly amused by it. The drawing of the acorns is nice, the game has so much double think that you doubt all you ever knew about your friend(s) previously. There will always be some hilarious moments of "I knew what you did last round, so this round...". So much fun in this small green box. Can't recommend it enough. Last game for the day? Machi Koro!! 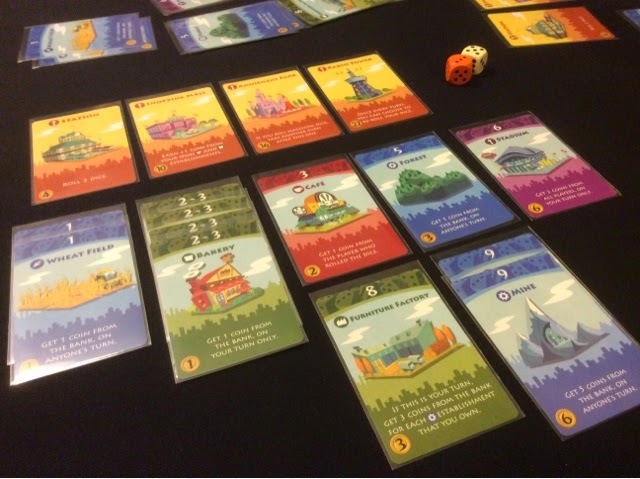 Machi Koro is a dice rolling engine building game. Players buy buildings that activate upon certain dice rolls ( either from everyone's dice rolls, or only your own dice rolls ). Players are trying to build all 4 landmarks in front of them to win the game. Each landmark when built, will also afford the player a special ability that they may utilize for the rest of the game. Machi Koro is extremely simple to play ( not sure about the teaching, for some strange reasons my friends couldn't remember that blue means everyone's dice roll, green is your own, maybe it was already late in the day ). On a player's turn, he/she first rolls 1 or 2 dice ( depending on whether you have activated the landmark ability ), after rolling, if the dice number corresponds to any particular building owned by a player, that player will collect some money. You will know when the building activates as the color ( and text ) will tell you when the building activates. In short, Blue = everyone's turn, Green & Purple = your turn only, Red = other player's turn. Players are trying to form a combination of numbers that they think will best power them to victory. At the end of the day, it does get decided by the dice rolls, but throughout the course of the game, I find most people don't mind it too much. You choose to invest in something, when it doesn't work out, you find some other way. I've yet to try the very high numbered buildings after my initial failure on my first game, so maybe I will try that route one more time in my next game. But for now, I think the game really needs the expansion. I can see myself tiring out on it after a few more plays. Come out soon expansion! I need you! Well, that was it. Another game day in the bag. I love that I keep going back to my old games. I don't realise how much I love them till I get to play them all over again. Now I really want to take out Ristorante Italia again. I HAVE to win that game one day. Right?